I think the Smalls have all decided that my craft room desk is the best seat in the house. They camped out there during sunny days, and now that days are darker, with a lamp as a substitute sunbeam, they're still there. It is a good spot to roost and nap. It's nice having them close by and because they're Small, they don't take up too much space on my desk, so I still have room to work. Loving Liam's chicken wing sticking out. 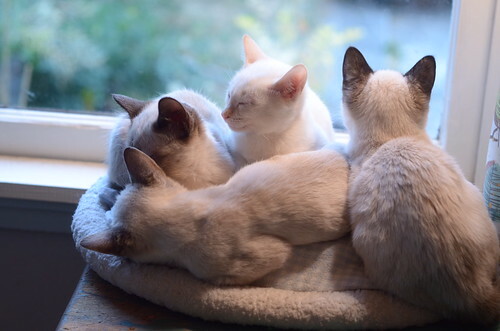 Those sleek kitten bodies are quite the distraction. I think taking these pics is getting plenty done. 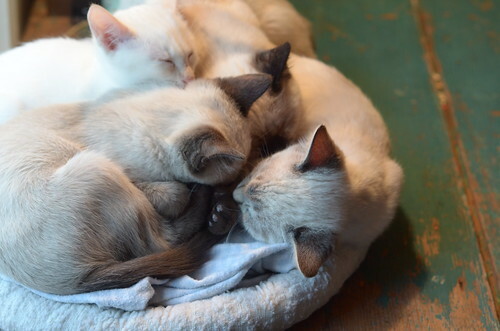 Oh my gosh, I'd pet kittens all the live long day! This has killed me. Killed me dead. 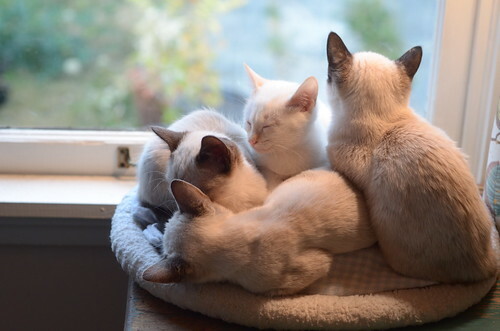 Wow...I want in on that snuggle pile. 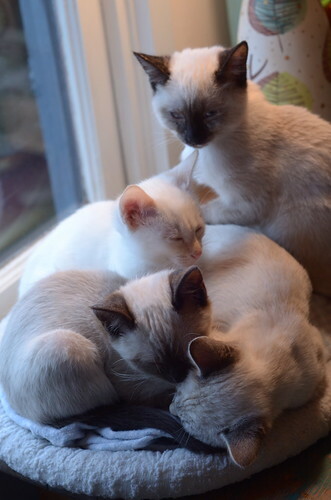 Gorgeous babies. 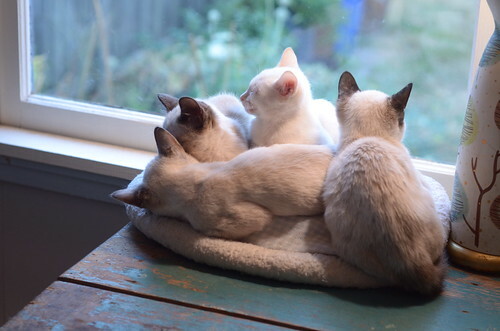 I can't imagine getting anything done with such darlings nearby. They're getting so nice and round! They look soooo soft. 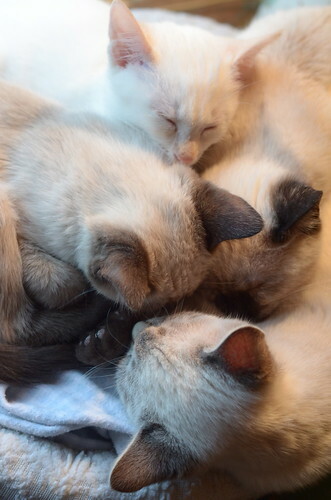 I could really use a pile of four snoozing kittens next to my desk right now. 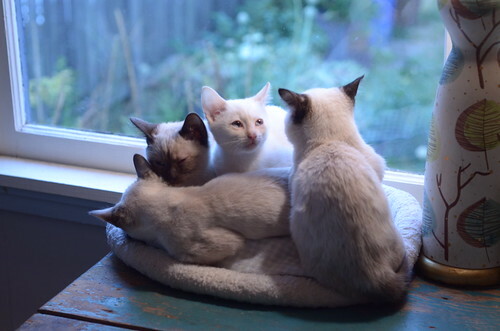 I had a dream last night that Saya adopted all four Smalls... can we make that happen?! 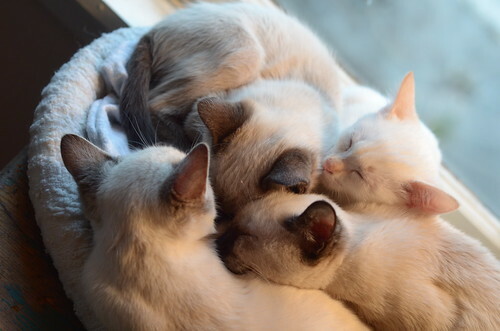 My face would fit perfectly in the middle of that kitten pile (as long as I take off my glasses). I love to kitty huff. OMG "kitty huff" that is PERFECT!!!!! How indeed! I love their color scheme....pale poetry! I heart the Smalls! Too bad they can't move to NH! Wow, it looks like Liam is going for the Olympic Gold in the 400m nap. They look like they could be in utero. I truly hope they are all going to one home, or at most, two homes, two by two!! Love 'em, thanks for the post. 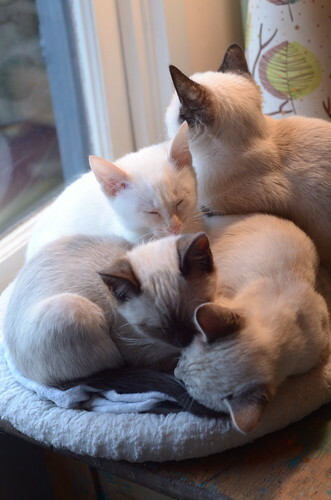 While they're awfully cute, what do you do about the small problem of cat hair in your crafts? Equally, what about craft gunk getting on your cats? I can't keep my own hair out of my hobbies! It really isn't an issue. 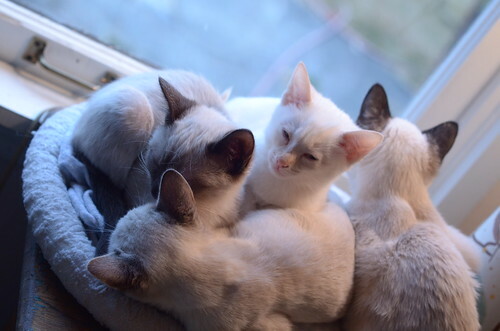 Kittens don't shed much, if at all.